The hilarious Benny Hill is widely regarded as one of the greatest comedians of the 20th century. His groundbreaking TV series ran for many seasons, most popularly produced by Thames Television from 1969-1989. A&E Home Video is now releasing the complete 20 year run of the series. The set contains 58 episodes on 18 DVDs and will be sure to delight his many fans! 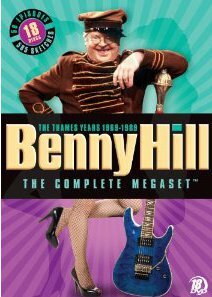 BENNY HILL: THE COMPLETE MEGASET contains Benny’s raucous 20-year reign over the television-sketch variety genre, from the naughty early years to the debut of the nubile Hills Angels, through the final episodes. Witness the birth of crazy caricatures like Fred Scuttle, Chow Mein, and Pierre de Terre. Laugh out loud as Benny and his bevy of buxom babes flaunt their racy rowdiness and tongue-in-cheek satire in characteristically outrageous sketches like The Little Dimpton Street Party and The Crook Report. Thanks to Jelena at A&E Home Video, I have one copy of Benny Hill: The Complete Megaset to give away! To enter, just leave a comment naming your favorite comedian. Be sure your email address is in your comment or visible in your profile (if you have a blog) so that I can contact you. Open to the US only. Contest ends 11/3. Good luck! I love Jeff Dunham and his puppets. Spike Jones and his comedy music. awesome contest I watch this with my grandfather all the time on tv. I always liked Bill Cosby. I love Vince Vaughn! He cracks me up! I still enjoy George Carlin's work. George Carlin is my favorite. My favorite comedian is George Carlin. Steve Martin is a great comedian-and writer! Thanks! Favorite is old Dennis Leary-No Cure for Cancer era--now I have to go with Dane Cook --stand-up not acting! Ever? George Carlin. Living? Louis CK. Ellen Degeneris is my favorite-she is so sweet and funny, never mean. Steve Martin had some hilarious old skool jokes and magic routines he did for stand up before all the funny movies. gaeoge carlin made me laugh too. Benny Hill is one I honestly admire, for his proudly, unapologetically bawdy strain of humor. (something you may know...on several of the 1980's vintage episodes of Benny's program, one of the background dancers is actress Jane Leeves (FRASIER and HOT IN CLEVELAND). I love Robin Williams and Benny Hill. My favorite is robin williams. I've become a big fan of Russell Brand lately! Loved his book! Thanks. I kind of have a thing for Don Rickles, but I used to love Benny Hill's show. I've always loved Rodney Dangerfield. There was something so endearing about him! Personally, I like Bill Cosby. But Benny Hill is my brother's favorite comedian and would be thrilled if I gifted him this amazing DVD set. Thank you for the chance to win. John Cleese always cracks me up! Thanks! George Burns and Gracie Allen are some of my favorites. I love John Cleese from Fawlty Towers. I'm a huge fan of Ellen DeGeneres both as a comedian and a host. My favorite comedian is Robin Williams. I like Aziz Ansari. Thanks for the giveaway! My favorite is Don Rickles. I love Bill Cosby and Dane Cook, thanks! My favorite comedian is Larry the Cable Guy. Currently: Joan Rivers and Margaret Cho. My favorite comedian is a group--Monty Python's Flying Circus. The best ever. My all time favorite is George Carlin, RIP! Conan O'Brien is my favorite!